Solstice Weekend 2004. The Dust to Dawson / Smoke to Tok / Smoked Chicken Warriors trip. 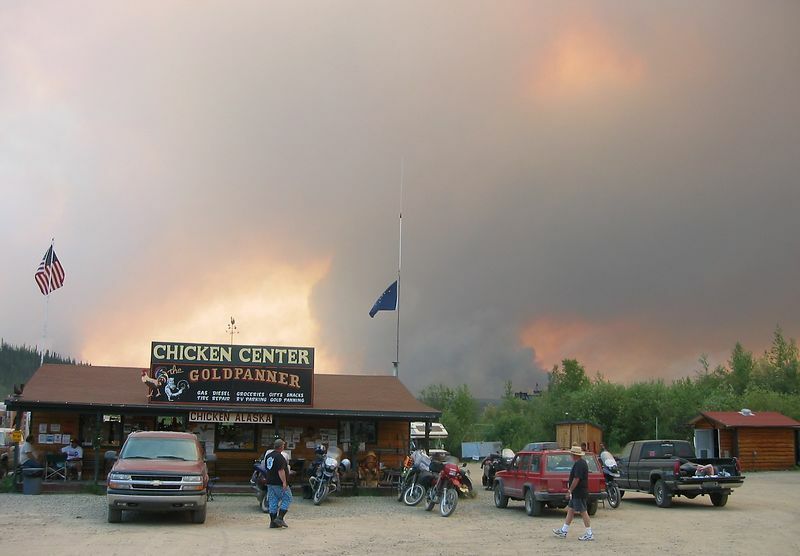 This was the beginning of the worst fire season in Alaska history...6.2 million acres burned by the end. How wrong can you get. This is on the way back when the wind changed direction and was blowing northeast. The fire burned right across the road and stranded all the riders from Anchorage as well as about 60 motorhomes. We were stuck for about 13 hours until Forestry managed to lead us through the still burning area at midnight. That began the longest ride as there was nowhere to stop for a hotel between Chicken and Delta Junction 250 miles away. So it was ride until tired and then sleep on the roadside pullouts. I didn't see another vehicle until Delta.